In early 1942 a courageous band of Welshmen found themselves fighting side by side against the all-conquering Japanese army. The men, who had joined up to provide air defences for Cardiff, Newport and Barry, had been sent to the Far East as the Japanese bore down on Britain’s “impregnable fortress” at Singapore. But the battle-hardened Japanese swept through the jungles, mountains and mangrove swamps of the Malay Peninsula and took Singapore in seven days. So, instead, the men of the 77th Heavy Anti-Aircraft Regiment were diverted to Java (now part of Indonesia). Many of the 77th were sportsmen. A large number of the pre-war Cardiff RFC team were among its ranks. There were Glamorgan cricketers and footballers too, including a veteran of Cardiff City’s 1927 FA Cup winning team. Like all sports people, they’d sometimes had to chase lost causes – but not like this one. They were forced to put down their guns and begin more than three and a half years of captivity. The focus of attention on prisoners in the Far East is understandably often drawn to the Thai-Burma ‘Death’ Railway, built by the forced labour of prisoners of war. But many prisoners captured on Java were sent to Japan and some found themselves in a camp not far from the city of Nagasaki. They would eventually, after years of hardship, witness the unleashing of a new weapon by the Americans, the plutonium bomb. Among them was Les Spence, who had captained Cardiff RFC in 1936-37 and would go on to be a president of the WRU during the 1970s. 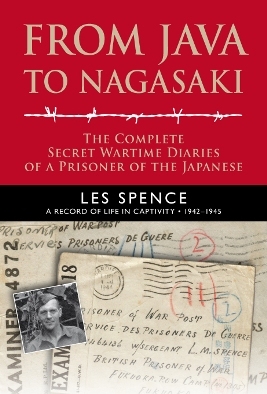 A keen observer of human nature, Spence – who was promoted from sergeant to sergeant major soon after his arrival in Java – decided to keep a secret diary, which has now been published as a hardback book, “From Java To Nagasaki”. Spence’s writing takes in the surrender of Allied forces on Java, the conditions and life in the camps and the growing death toll. The 77th had trained to fight the Germans in the deserts of the Middle East but the Japanese attack on Pearl Harbor on December 7, 1941, meant they were diverted to the Far East. Their troopship, part of a large convoy, arrived in Batavia (now Jakarta) on Java on February 3, 1942. What he writes for the next few years is a remarkable testament to courage and endurance in the face of hardship and cruelty – and a firsthand account of how to hold on to hope when all seems lost. The 77th’s defence of Java got off to a terrible start as the army tried to move many of them by train to defend the east of the island. We left by train for Surabaya at 6.30am, all in wonderful spirit… We stopped at our last station at 11pm and on leaving we sang Cwm Rhondda. Then at 3am in the morning a terrible catastrophe befell us. The troop train had crashed into an ammunition train. Around thirty members of the 77th were killed and nearly one hundred injured. The cause of the crash remains unknown, although some suggest a signalman loyal to the Japanese might have been responsible. The “poor old Ken” referred to by Spence was Battery Sergeant Major Ken Street, a well-known Welsh rugby forward. He had played alongside Spence and Wilf Wooller, an officer in the 77th, for Cardiff Rugby Club. For several days the remaining men of the 77th tried to defend Java. But for both British and Dutch forces on the island, the situation was hopeless. But surrender was to be just the start of Spence’s story. For the first 18 months Spence and his comrades were kept in two prison camps on Java. Spence keeps a daily account of how they coped with their new life and with the ever-present fear of death from starvation or disease. Spence makes regular notes in his diary about news received from outside, which he codenames ‘ice cream’. It’s unclear but the news may have come via an illicit radio. The sportsmen in the camp quickly got round to organising rugby ‘internationals’ and a football ‘league’. Also playing these strange games behind the wire fence in Java were Welsh international Ernie Curtis, who had been the youngest member of Cardiff City’s 1927 FA Cup winning side; former Cardiff City and Wales centre half Billy James and Cardiff City goalkeeper John ‘Jackie’ Pritchard. 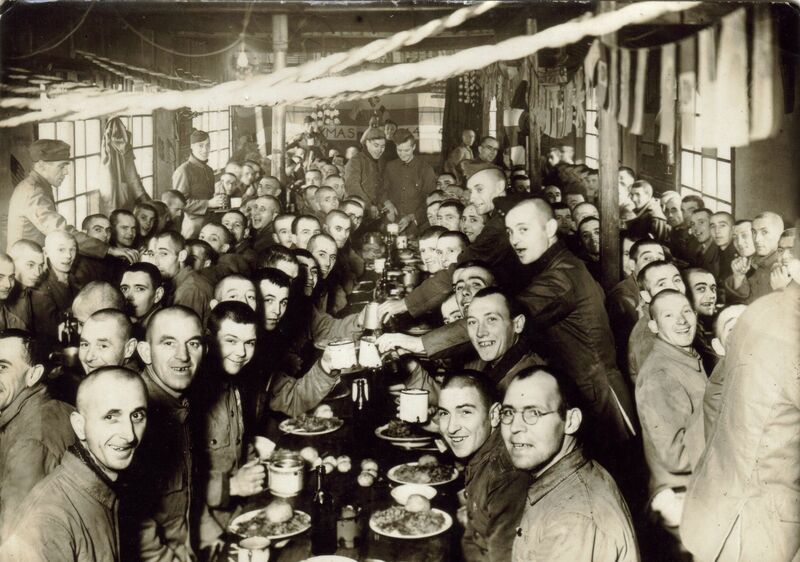 Propaganda picture taken at Christmas in Les Spence’s POW camp in Japan. Perhaps the most dominant player, according to the diaries, was Lieutenant Wilfred Wooller. Wooller was one of Wales’ greatest all-round sportsmen. Before the war he had not only captained Wales at rugby, he had played cricket for Glamorgan, briefly played up front for Cardiff City and represented his country at squash. After the war, he went on to captain Glamorgan to its first County Championship and to become a test selector for England. He would also become a distinguished writer and broadcaster. Spence and Wooller were to spend a lot of time talking about the old days. At one point in his journal Spence remembers April 22, 1939, a “big day in the history of Cardiff Rugby Club”, when they had been in the team which won the Middlesex Sevens at Twickenham. Remembrance of good times past would be important to the prisoners. After all, they had no idea when they might get out, if they got out at all. “I look back on my past life and deplore the time I’ve wasted,” Spence wrote in October 1942, while also wondering if his girlfriend, Babs, was well. He wished he had proposed before he left and feared he had now left it too late. In September 1943 Spence and some members of the 77th were loaded into the hold of a ship called the Ussuri Maru. After brief stops in Singapore and Formosa they arrived in Japan a month later. For the next two years Japan would be Spence’s home. He and other members of the 77th were housed in what the Japanese designated Camp 8 Kamo near the village of Inatsuki or Inatsukimachi, in Kyushu, Southern Japan. This was a coal mining camp producing fuel for the Japanese war machine. The prisoners were forced to work in the mine. Liberation for the prisoners came following the dropping of the plutonium bomb on Nagasaki, a city less than 100 miles from Spence’s camp. Only four planes flew on the raid that destroyed Nagasaki, and the camp did not understand what had happened at first. The Japanese guards were in a state of confusion for days. On August 18, 1945, Spence’s diary marks his 1259th day as a POW. But it is more than a month before he leaves Camp 8. The prisoners were taken by sea to San Francisco. They then travelled east by train and boarded the Queen Mary in New York on November 13, 1945. As the luxury liner began its trip to Southampton, the soldiers received a distribution of letters from home. After the war, Les married Babs. 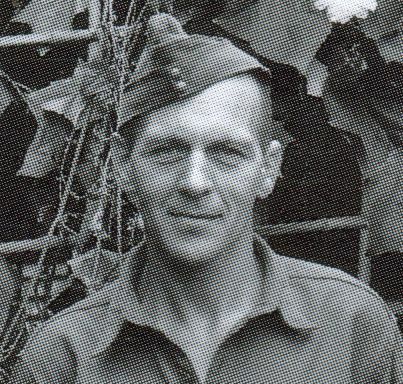 His friend and former fellow POW Wilfred Wooller was his best man. As well as running the family china and glassware firm, Les returned to his love of sport. He was to become chairman of Cardiff Rugby Club and joint secretary of Glamorgan County Cricket Club. By the time he died in 1988, aged 81, Les Spence had become one of the leading administrators in Welsh sport. Memorial gates were installed at Cardiff Arms Park in his name. * ‘From Java To Nagasaki’ is published by Magic Rat Books (www.magicrat.co.uk) and is priced £16.99.